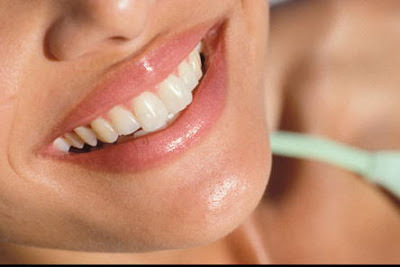 Teeth Whitening - Want to Have White Bright Teeth? It happens because of your genetic or hereditary, consuming drugs such as antibiotics excessively. Consuming foods or beverages that can change color like tea, coffee, red wine and smoking. A very popular way to whiten the teeth is by using home bleaching gels. You can easily buy this product at the drugstore. Bleaching gels are external whitening that only works on the outer layer of teeth, so the result is less effective and did not last long. So, it’s better if you consulted to the dentist before you use tooth whitening products. It’s because the materials that commonly used as bleaches include hydrogen peroxide, sodium perborat, and karbamid have reactive peroxides. Some researches found that reaction from karbamid peroxide cause inflammation of the mouth mucosa. Several other studies also show that teeth whitening can stimulate absorption of pathological roots and increase the teeth fragility. Naaah, if your teeth fragile, how can you eat your favorite ice cream without suffering? So you better go to experienced dentist. Your dentist will perform variety of safe procedures to make your teeth brighter. Your dentist can determine the kind of treatment in accordance with the conditions of each patient. Many dental cares can be done in office’s dentist, but the most favorite treatment today is laser bleaching because the result is instant and satisfying. But unfortunately, you have to spend more money to pay the costs. So prepare to save money, because the price for laser bleaching is about $ 1000 or more. But if you don’t have that much money, you can get tips on cheap and natural whitener teeth.